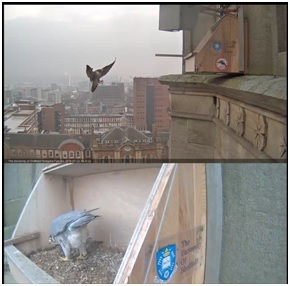 Welcome to the Sheffield Peregrines blog, which will give updates on the comings and goings of Sheffield’s urban Peregrines, updated by members of Sheffield Bird Study Group (SBSG). The Peregrines have successfully bred for the first time in the city in 2012, on a specially-erected nest platform on The University of Sheffield‘s St George’s Church lecture theatre. Keep your eyes on the blog for further updates and photographs. 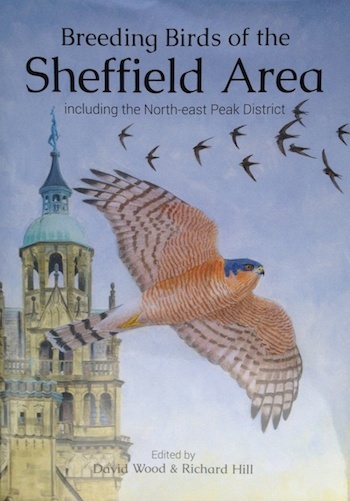 Sheffield Bird Study Group was formed in December 1972 as a forum for birdwatchers in and around the city with an active interest in ornithology. The group’s recording area, covering twelve 10km squares with the city roughly in the middle, is hugely diverse, stretching north to the outskirts of Barnsley, south to Chesterfield, east to the lowlands beyond Rotherham and Bolsover, and west to the highest tops of the Peak District National Park. SBSG is a registered charity (No 510857), and our constitution, recenty updated to reflect technological changes, is available to members from any Committee Member on request. to work with and complement the work of like- minded local and national organisations for the benefit of birds, such as detailed survey work for external organisations who value our expertise, liaison with national organisations such as BTO in the local fieldwork for national surveys, and species protection work for birds such as Goshawk and Hen Harrier. For more details about the group, including membership information and a wealth of information about the birds of the Sheffield area, see the SBSG website. When I was a relative newcomer to the wonderful life of wild birds, I remember feeling so very privileged to have been informed about a pair of Peregrine Falcons breeding on the cooling towers close to Meadowhall, especially as a few months previously I remembered being a passenger in a car driving from Rotherham close to the M1 and seeing a bird flying downwards at incredible speed towards a small flock of Lapwings and thinking, ‘could that have been a Peregrine?’ I must say that a year or so later I became aware of a pair of Peregrine Falcons breeding at Rocher Rocks on the outskirts of Sheffield and spent many a free hour observing them bringing up their young, I was fascinated and became hooked. Since then I have been totally enthralled with these fantastic birds and I have to say that I feel so, so very privileged to have been able to view Peregrine Falcons relatively close to where I live. This year’s breeding pair at St George’s is just so fantastic and it is an incredible happening, to have here, in Sheffield City Centre, a successful breeding pair of the most absolutely beautiful birds in the world, the Peregrine Falcon! What a privilege! Having seen the Chichester Cathedral Peregrines when I was visiting the UK at Easter I discovered your blog and web cam. Now back in Thailand, I have been thrilled to be able to follow the birds this year. Thank you so much for such an informative and beautifully presented blog. Wonderful photos! It’s great to know there are so many of ‘us’ watching. Many thanks. I saw one of the chicks fall off the nesting box around 10 am (02.06.15) and wonder if she is OK? I can’t seem to find any updates and am not on Twitter! Just been on site, safe on ledge above clock under nest. Thanks Pete – that’s so reassuring! I’ve been watching them from day one so feel quite attached to them!! !